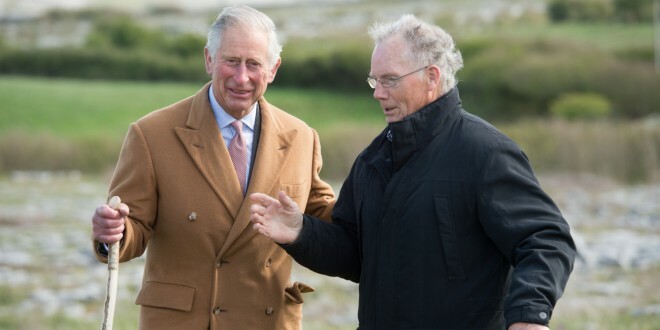 His Royal Highness Charles, Prince of Wales, expressed his desire to return to the Burren in the future and invited two North Clare farmers to come to his estate in Norfolk, when he visited the farm of Pat and Oliver Nagle at Pullaghcarron this afternoon. The Nagles farm 70 acres at Sliabh Carron, with 16 cows and one bull, from October to May. Prince Charles was invited to Clare by Burrenbeo Trust and Burren Life. The Nagles’ farm was selected as the location for the visit because they have the highest score of any farm under the Burren Farming for Conservation Programme. When the prince arrived he was greeted by Pat who guided him across the rocky landscape before introducing him to Michael Davoren of Burren IFA. Dr Brendan Dunford of Burren Life outlined to the prince a little of the history of the Burren, its landscape and spoke about the Burren Farming for Conservation programme. Prince Charles learned about the geological and archaeological features of the area from pupils from Carron and Boston National Schools who are graduates of the Burrenbeo Trust’s 20-week Ecobeo programme. Dr Sharon Parr spoke to the prince about the ecology and biodiversity of the Burren. Brigid Barry, co-ordinator of Burrenbeo Trust, explained a bit about the organisation and how it works. Prince Charles met Burrenbeo Conservation Volunteers who outlined some of the various butterflies that are native to the area, although strong winds hampered any possible sightings at that stage. His Royal Highness then tried his hand at dry stone wall building under the guidance of Oliver Nagle and conservation volunteers. At the end of his visit, Prince Charles, was presented with walking sticks and a hamper of locally produced food, including honey from bees in hives located just across the road. Young musicians from Coole Music, the Kinvara Quintet, performed classical music for the prince as he left the farm, bound for a private dinner with his wife the Duchess of Cornwall, President Michael D Higgins along with his wife Sabina, the Tánaiste Joan Burton and a small number of local invited guests at Lough Cutra Castle.